But fungoids are much stronger than regular ogres! What ecological niche does that imply? Why, the fungoid must prey upon things that eat ogres. Adventure Seed: Standard "defend a village/band against a monster that's picking them off", only the innocents are ogres! They're from - huh, AC8 - Bestiary of Dragons and Giants. Huh, that's unexpected. I understand it was basically a set of "ecology of" articles plus sample encounters/scenarios. So, a new kind of "giant" ? There's been a miscommunication somewhere. AC8 was a code assigned to The Revenge of Rusak which was printed with the code AC3 and was supposed to be labeled AC5 but ... anyway, it did introduce fungoids as a new monster. 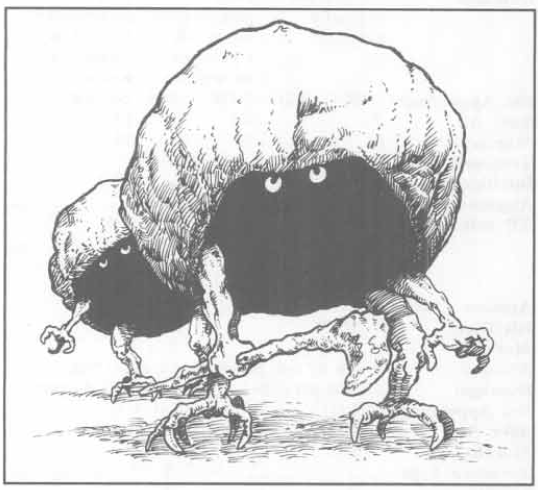 The encounter basically just has one of them serving as a guardian of a bunch of tasty mushrooms that your party discovers and might try to take for food supplies. When treants aren't enough, you call in the gakaraks. Gakaraks are eighteen feet tall and resemble treants, but they are "much darker in colour and shrouded by ancient, blackening mosses and lichens." So, gakaraks are . . . black treants? I don't like where this is going. Gakaraks have 16**** HD and AC 0. They attack with a magical club for 4-24 damage; in addition, anyone struck by the club must make a Save vs Spells or be entangled in writhing vegetation for 6 turns, unable to move, attack, or cast spells until freed by another. Alternately, a gakarak can fire wooden darts from its hands, four at a time, for 1d8 damage each (range 50/100/150). Gakaraks are also really darn tough. They're immune to electricity, wooden weapons, and attacks by plants or animals. Blunt weapons do 1 damage (plus strength and magic bonuses). While in contact with vegetation, gakaraks regenerate 3 hp per round. They move at a surprisingly sprightly 180' (60'), have an Intelligence of 13, Morale 10, and are Neutral. A gakarak can exercise some control over the plant life within 360', causing it to rapidly overgrow trails and clearings, and even move. Within 90', it can animate trees and bushes, up to six at a time. Animated bushes have 2-8 HD, AC 5, and attack with a branch for 1-8 damage; animated trees have 5-12 HD, AC 2, and attack with two branches for 2-24 damage each. Gakaraks are described as "some of the oldest living creatures on the Prime Plane. They dwell deep in the heart of ancient forests, where they brood on their aeons-old hatred of humans and demi-humans, all of whom are considered hateful tree-slayers." Also, "The long-nurtured anger of a gakarak will pervade the entire forest with an atmosphere of impending doom." So they're kind of jerks, by the standards of (demi)humans. Gakaraks are what you use when treants aren't tough enough or angry enough. ...does that tree have an afro? ...mmmmaaayyybe. The one thing I can say for sure is that the way it's drawn it kind of looks like it has a 'stache. Groot! 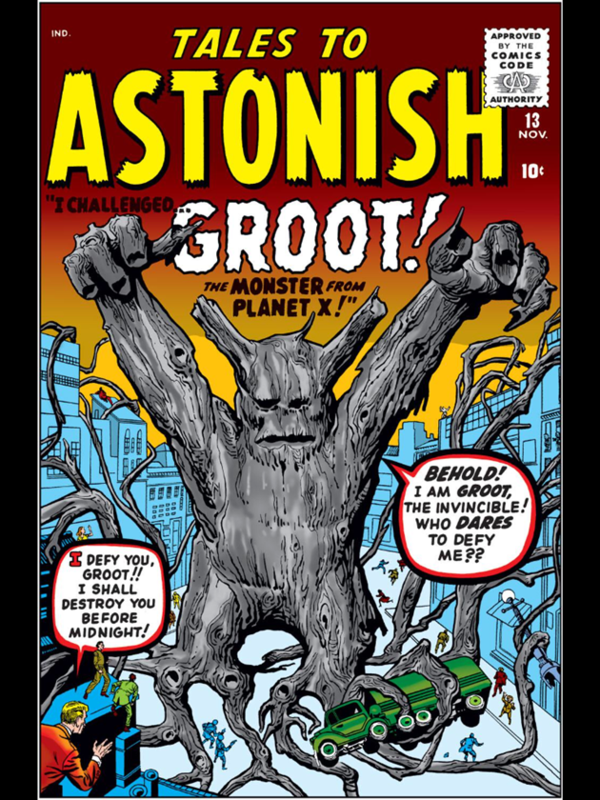 Or at least an early version of Groot had those wooden darts. 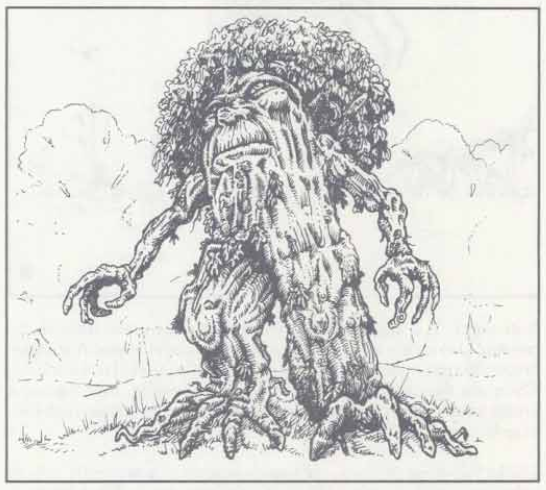 And I don't see them as jerks, just more in line with druids who fight rapacious civilization than standard treants. Well, they're described as hating all (demi)humans, not just the ones that are actually causing harm to forests, which seems kind of jerkish to me. Geonids are "small, intelligent cave-dwellers" with two arms, two legs, and a shell that resembles a small boulder. No other details on their appearance is given, but based on the picture they have clawed bird-feet. A geonid can withdraw its arms and legs inside its shell, turtle-like; in this state it cannot be distinguished from a rock. Because of this, geonids surprise on 1-4. A geonid has 2 HD and an respectable AC of -2. It attacks with either a stony first (1-8 damage) or a weapon, typically a club or stone axe. Geonids move at 60' (20'), have an Intelligence of 10, and are Chaotic. They come in groups of 2-12 and are only found underground. Geonids live in natural caverns and tunnel complexes, which are filled with rocks, stalagmites, and stalactites. A typical lair will also contain a shrine "made of large and oddly-shaped boulders, dedicated to the geonid deity," about whom we are given no information. A geonid lair contains 30-80 (1d6x10+20) geonids, who are led by a 4 HD priest. The priest has no clerical powers, but does 2d6 damage with a punch or +2 damage with a weapon. Geonids look like the sort of aggressively adorable little creature that was forever being used as a sidekick in '80s fantasy shows. Their alignment is Chaotic, so I guess they're meant to be enemies, but we're given no reason why. Frankly, we're given no hint of geonid culture at all, and since they lack the mythic pedigree of creatures like goblins and ogres, there's not a lot to go with.